Інститут драми - портал, створений спільно з Театром Переселенця, в якому не просто фіксуються процеси актуального театру, а театральні та драматургічні досліди виводяться у широкий контекст. Це блог думок, висновків і перспектив подальших кроків. Це розгорнуті спостереження за живим процесом творення нового театру - простору людей. Спроба фахівців зі сфери сучасного театру: драматургів, режисерів, театрознавців, оформити та організувати актуальний інформаційний театральний контекст в Україні. 4p.m Sunday 29th January. Performance time. 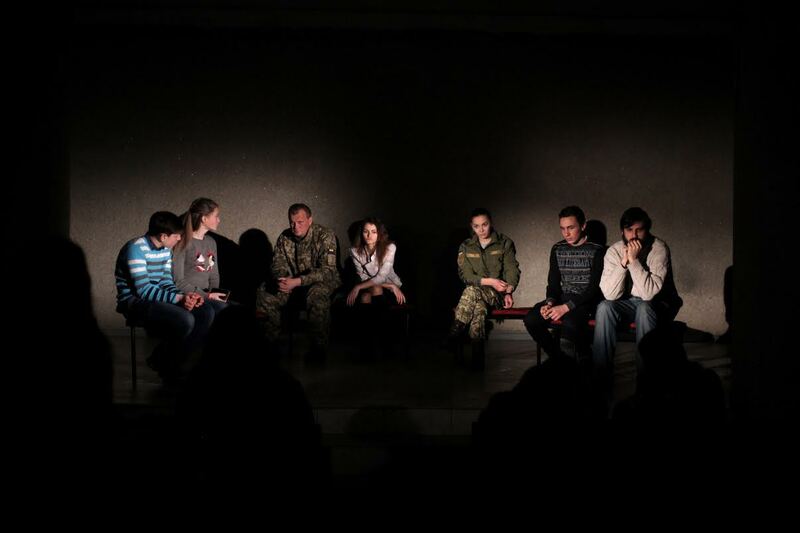 The Theatre of Displaced People are staging ‘Attempts on Happiness’ – the final part of their project working with children and soldiers in Eastern Ukraine. There are bin bags over the doors to the House of Culture and the entrance hall inside where the performance will take place is quite dark. Just a couple of lights pick out a handful of teenagers sitting on the cloakroom table top, swinging their legs nervously, some more sitting beside a couple of soldiers who look just as nervous, all watching as the hall fills with their friends, classmates, parents, teachers and colleagues. There isn’t enough room. There are people standing round the sides and bottlenecking the entrance. Rewind a week, it’s about -15, the sun is out and the snow is so bright I wish I’d bought my sunglasses. We got as far as Konstantinovka on the train and are now driving through a white desert. The soldiers at the checkpoints are a bit baffled by our mix of Ukrainian, German, Russian and British passports but on we go over miles and miles of flat, glistening steppe, the occasional tree, the occasional building, the occasional run down factory. It would be serene gazing out of the window apart from the fact that the road is terrible, my seat in the boot isn’t attached to the floor and I feel like I’m on a bucking bronco. We stop off at the winery in Bakhmut (formerly Artemsk but renamed in 2016 as part of the de-communisation programme), pass the sign for Serevodonetsk painted bright blue and yellow before turning southwards and continuing east to a town called Shastya. Shastya means ‘happiness’ in Russian. Anyone hoping to “act” in a performance, as one boy in the front row is, will be disappointed. As their logo confusingly hints by the way the word ‘theatre’ is crossed out, TODP is not-quite-theatre, but not-not theatre. Maybe it’s just how theatre should be. Appearance wise their performances are characterised by very sparse stages with nothing to distract from the performers themselves. They perform in unusual spaces and always make them feel intimate by using darkness and warm lights. The seats are often haphazardly arranged so each audience member has a different view, of each other sometimes as well as the performers. 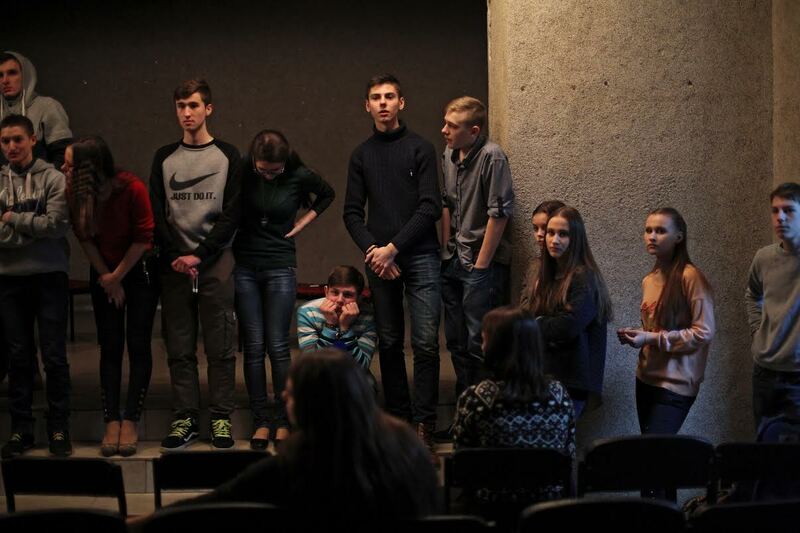 They experiment with different media; music – in Shastya the pupils sing interludes. Film footage – in Shastya too one of the pupils Alim shot some ‘video portraits’ – or rather a montage of his friends trying and failing to keep a straight face. TODP tries to distance itself as much as possible from the hierarchies often associated with theatre making. 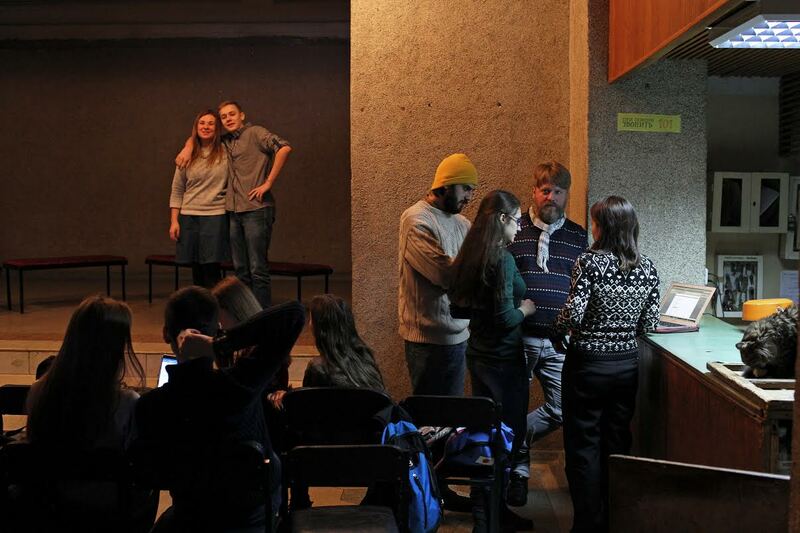 It is a form of documentary theatre, but it’s own specific form. They do not use actors for example, rather the protagonists are people being themselves onstage, and they drive the rehearsals rather than a director or playwright. So their performances are as varied as the people who are telling their stories - even within the ‘Children and Soliders’ project which before Shastya has been in Mikolaevka, Popasna and Slaviansk, the performances are completely different. When someone asks in that first meeting in the school hall “What will this performance be about?” Natasha admits “We don’t know yet. Those of you who decide to take part - it will be entirely up to you. It will be about what you want to talk about. We want you to be honest. Maybe think about what you most want to talk about tonight…maybe about what Shastya – the place and the word mean to you”. The kids don’t need until tomorrow. They start talking there and then on that first evening and carry on throughout the week. “We are excited you’re here. Nothing happens in Shastya”. Well…apart from war, the signs of which are all over the place. The shelled supermarket opposite where we are staying. Though, as one of the teachers points out, a lot of the rundown, empty buildings here were like that before the war began. Eastern Ukraine is more depressed than Western Ukraine, one of the reasons there are more separatists here who want to be part of what they see as a stronger Russian economy. 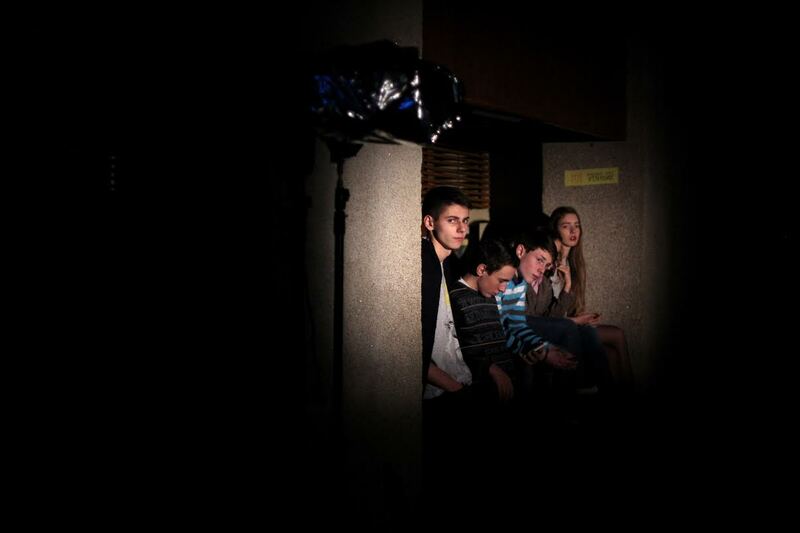 Some of the kids complain about how Ukrainian soldiers accuse civilians in Shastya of being separatists. And about how sometimes the soldiers are drunk and behave badly despite the fact they are banned from drinking while serving. 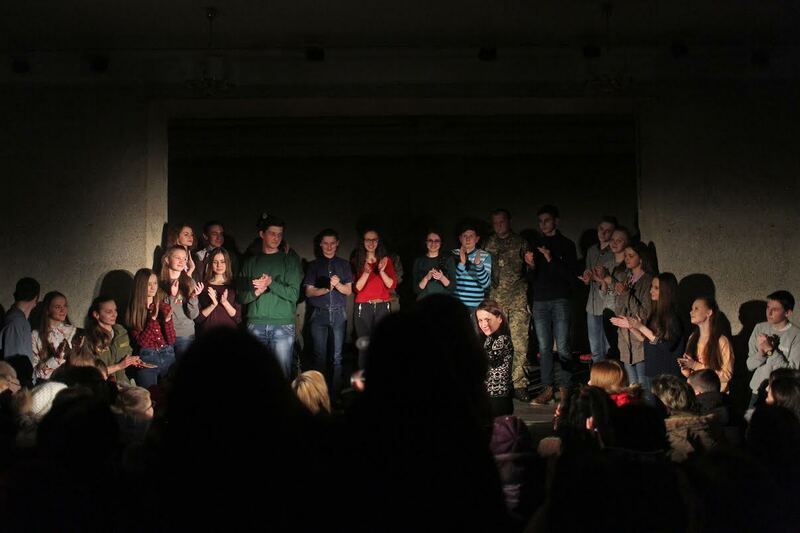 In the first meeting between the soldiers and pupils one of the soldiers asks if the kids speak Ukrainian. School No. 2 is Russian speaking. 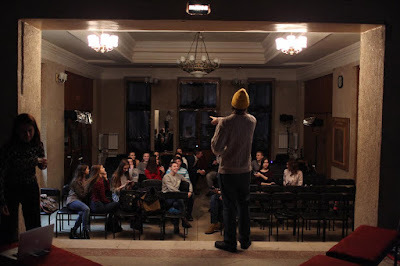 Though TODP describe their work as a social project engaging with rather than shying away from some of the problems Ukraine faces today; the war in the East, the divides between Eastern and Western Ukraine, the problems displaced people face integrating into their new homes, in the first meetings they are keen to avoid such divisive political topics. Their form of engagement is getting people to connect, making soldiers in their uniform less anonymous and intimidating by encouraging them to share personal stories, light-hearted or serious. For example, Georg begins the first class by confiding a secret happiness of his “I used to love turning off the lights when someone was in the loo.” The responses are great. “When I’m sad I dress up. I put on make-up, I dress well and I go out walking” says Alina. Her friend Diana adds, “Whenever I see her looking that good I know to ask her if she’s ok. As for me, when I’m down, I buy a pack of balloons. I live in a flat high up. I fill them with water and I drop them off our balcony.” One of the soldiers describes how much better a cup of coffee can make any situation. On one of the days the kids take us on a tour of Shastya. They take us to the TES power plant just outside the town that provides Luhansk’s power. 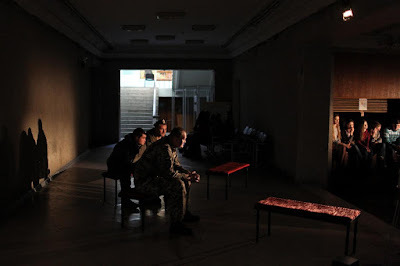 In 2014 one of the Ukrainian Battalion commanders announced that TES was mined and would be blown up if separatist forces advanced. We walk around the snowed over stadium, past the sports centre, now closed, to a couple of shops, passed a restaurant, now also closed. 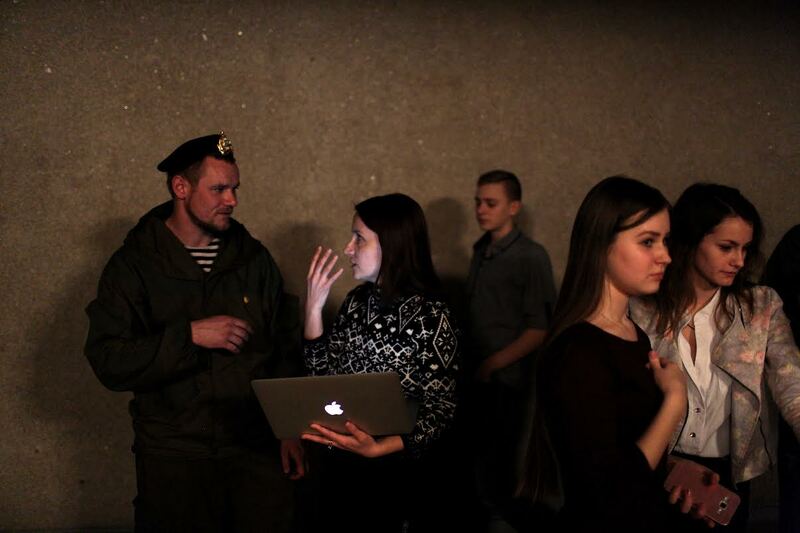 By Saturday 25 kids and 6 soldiers want to take part in the performance – the biggest number of participants of any of TODP’s performances to date. Watching the dress rehearsal is the highlight of the week for me. I have always been quite sceptical about how helpful sharing a difficult experience with a room full of people really is. Isn’t that one of the benefits of being able to use actors? So people don’t have to relive trauma? One moment in the rehearsal goes a long way in convincing me otherwise. Natasha is explaining how the performance will hang together. The first part will be about ‘secret happiness’, the second ‘first love’ (one of my favourite moments comes mid-way through some very emotional stories about unsuccessful relationships when one boy, Sasha, says ‘”enough about love. I want to talk about fishing.” And does). As the children and soldiers are saying their monologues, one of the shyer soldiers stays quiet. He doesn’t want to tell his. But as the rehearsal goes on suddenly he says; “I want to tell mine too”. This performance is a little different to the other TODP performances I have seen. Maybe because so many people are in it. Usually monologue follows monologue. But in this one there is a lot of live discussion. One boy Danile describes falling in love four times. “I fell in love with a girl. I said to her, I love you, and she went away. I met a second girl. I said to her, I love you, and again, she went away”. And so on. He asks the girls sitting on the bench opposite him, ‘why is it, that when you are nice to a girl she doesn’t like you, but when you are more gangstery and mean, she does?” They explain why for them this is true or why it isn’t. It felt very organic and though the war was mentioned, it was as far in the background as it could be. I suppose that means that the people in this performance wanted to escape it for a bit. The week finished with a big dinner and toasts. From Oleg and Vitalik who’d been in the Children and Soldiers performance in Popasna and had come to meet the performers in Shastya among others. Some of the guys asked me to put them in my suitcase and take them to Kyiv and then London. For a place so outwardly grim, Shastya was an exceptionally welcoming and special place. My new secret happiness (which I pretended not to like) is my nickname ‘tyotya (aunty) Dais’.